Analysing multi sensor data is a complex process. MultiSens Analyzer has been designed to relieve you from the troubles of feeding your data through multiple programs and algorithms in order to derive the final result. Integrating the complete workflow of data handling for multi sensor instruments in one program. It combines feature extraction, filtering, scaling, data projection, classification and regression into a straight forward, easy user interface. MultiSens Analyzer handles all calculations automatically for you. Whenever you change a parameter, add an algorithm or change the data, the program discovers what parts of the analysis need to be recalculated. MultiSens Analysis performs all calculations automatically and updates any visualizations. Trying different algorithms, adding new data or sensors, changing filter parameters has never been easier. Just do the changes and MultiSens Analyzer adjusts all dependent steps automatically. Integrated into MultiSens Analyzer are a complete set of algorithms. These include statistical multivariate analysis tools like Principal Component Analysis, Principal Compont Regression, Linear Discriminant Analysis, Partial Least Squares as well as pattern recognition algorithms like Artificial Neural Networks or k-Nearest Neighbor classification. Noisy data can be filtered via a set of FIR and IIR filters. Feature extraction algorithms allow to select the most significant features of sensor response curves. Meaningful graphs that help you to better understand your data are only a single click away. Besides standard scores and loadingplots, we have integrated advanced graphs that also show the development of data over time, or help you to compare responses to individual classes. The program allows you to simultaneously show as many different graphs as you want. As graphs are automatically updated whenever underlying data or parameters are changing, this is a perfect tool, to find out how to best analyse your data. MultiSens Analyzer is open for extensions. MultiSens defines a number of software interfaces, that allow you to add your own algorithms. Write your own algorithms in Matlab, Delphi, Excel, C, Python or other languages and integrate them with MultiSens Analyzer. MultiSens Analyzer is using a data format based on XML to store all data. The data format is fully documented. XML data can be read by many different programs and programming languages on all modern computer platforms. Getting your own data into MultiSens Analyzer is simple in many cases. MultiSens Analyzer can read text, XML, Excel and Matlab files directly. 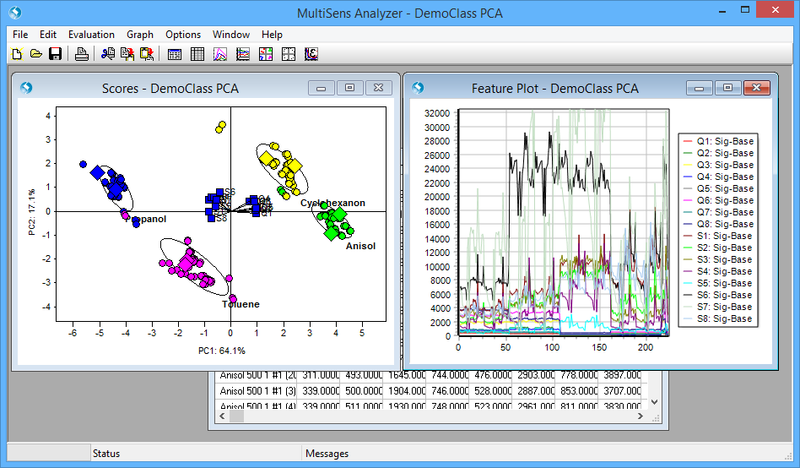 MultiSens Analyzer can export data into text, Excel, Matlab and other files. includes the core parts of the program and is targeted at users that want to analysis their data with fast and easy to understand classification algorithms. includes regression and filter algorithms in addition to all features of the Basic edition. adds Artificial Neural Networks and interfacing to external programs to the Standard edition. Windows 10 is the recommended operting system for MultiSens Analyzer. Windows versions above Windows 7 are supported. JLM Innovation offers training, support and development services to help you make the most out of your sensor data. Support packages include all updates released during the term of the agreement and additional support incidents.